The IS-6 Fearless is a special formidable-looking version of the IS-6. 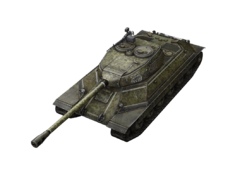 You can receive this tank as a reward in different events, for example it was awarded during the RU-cluster Supremacy Tournament that was held from November 20, 2014 through March 5, 2015. A special, limited edition version of the IS-6 premium heavy tank. Extremely rare to see on any battlefield, and no longer obtainable by any means. Very good front hull armor, more easily angled then most IS tanks. Plays exactly like the IS-6, best when at top tier, but does well against higher tiers. This page was last modified on 9 August 2017, at 02:57.